San Siro stadium, short distance from Hotel Certosa, favourite destination for sports fans, that in this historic facility will be able to experience the emotion of the most important Italian and foreign football matches. Music lovers could reach the Palasharp to attend the concerts of big star of the national and international panorama. In few minutes you can reach the most important trade fairs of the city like the Fieramilanocity and Polo Fieristico Rho . 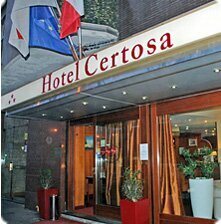 The elegant and comfortable rooms of Hotel Certosa, all recently refurbished, reflect the style of the city of Milan: comfortable, pleasant and spacious, elegantly furnished, which will serve as a frame for an unforgettable stay.